During the process of remodeling, about 10 years ago, we gutted the kitchen of our home. In the middle of it all, one of the ‘guys’ asked me if I would like a plate shelf over the kitchen sink. I hadn’t even considered this option, and I was delighted with the offer. I happily ‘rubber-stamped’ my approval. And here was where I learned my lesson about communication (in a working with contractors during a remodel sense). When I came home that day, the plate shelf was there all right. But the lip was deep. 2 ½” deep, to be precise. It never occurred to me that it would be THAT deep. It’s SO deep, that when you look up at it, most of what you see is the lip. And of course, it blocks the view of whatever is sitting on the plate shelf. I have learned that anything I use for decoration on the plate shelf must sit right on the edge. Back to the plate shelf. For many years, I really just used it as a plate shelf. I would collect plates and put them up seasonally. I also decorated the plate shelf for Christmas and Fall. But I began to realize there was much more I could do with the plate shelf. For Christmas and Fall, I would always create more of a vignette look (although sometimes it was just plates). And I was inspired by what I would see on other blogs that had either a plate shelf or a whole shelf that ran the length of the cabinetry. So I started to play around a little bit. And very quickly I realize it is harder to create a vignette on a plate shelf because you essentially only have 1 dimension (instead of 3 or 4) to work with. I think that is why just putting up plates is so easy. But I wanted something with a little more impact and color. 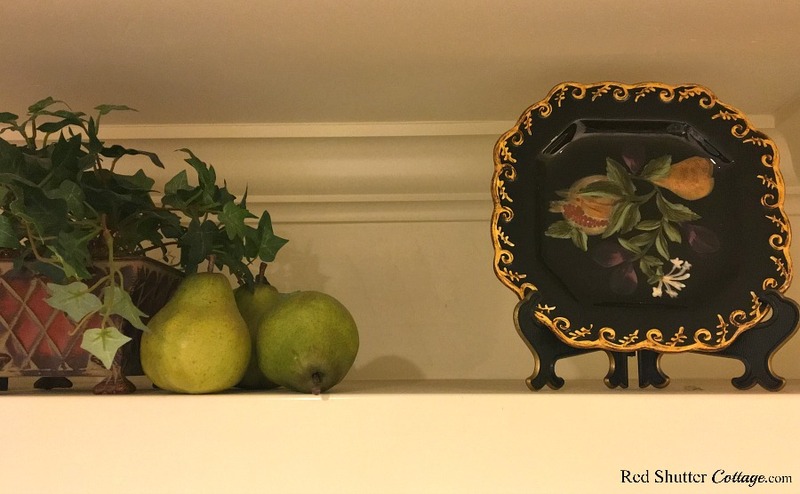 Speaking of color, decorating a plate shelf is not too far removed from decorating a mantel. 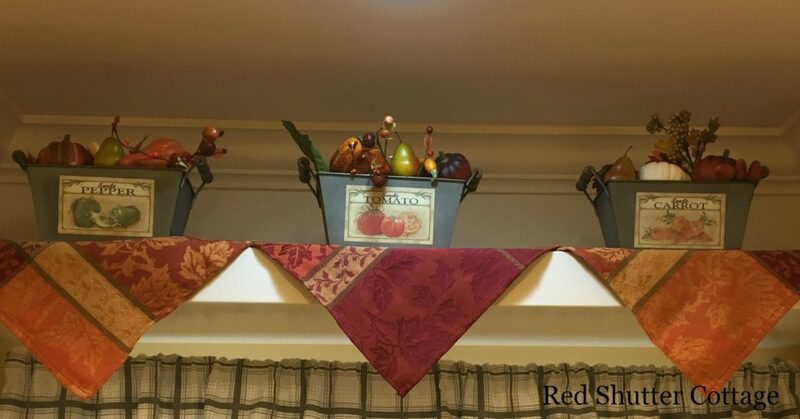 In my post “5 Steps to a Beautiful Mantel”, I put quite a bit of focus on color and keeping the colors within a 2-3 color range. The same principle applies here as well. This was my first attempt back in January. The red books on the left side are part of a set that belonged to my Grandmother. 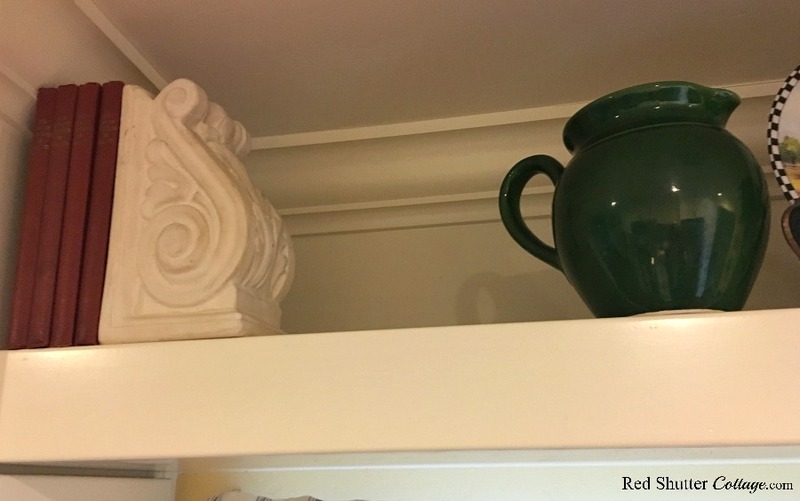 I found the corbel and the rooster plate (one of 3) at my ‘go-to’ thrift shop. The ivy came from another thrift shop; it’s very ‘90’s’, which is I probably why I like it. The green pitcher was on sale at Williams Sonoma, and the red rooster pitcher came from Home Goods. There you have it…random compilation at its best!! Even though I arranged it, and re-arranged it at least 5 or 6 times! The 2 main colors in this arrangement are the red and green, but the neutral background colors of white, brown and black, don’t really compete with or clash against those two main colors. I used the black plates as anchor pieces on either end. 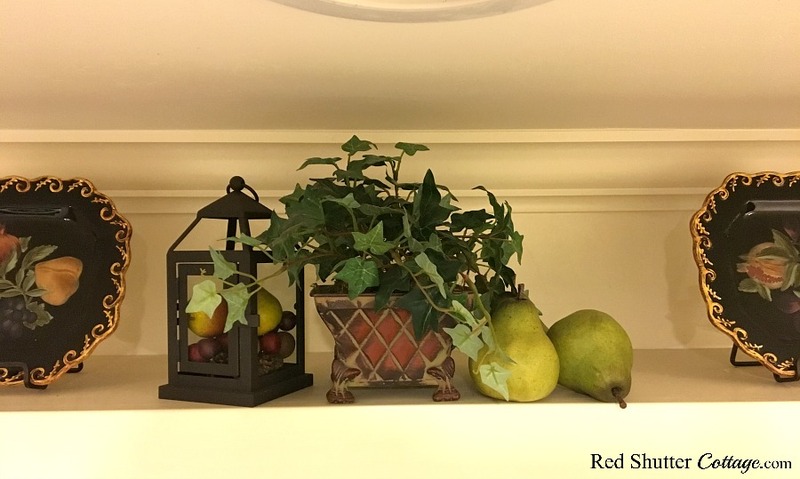 For the middle, I used the ivy again, and centered it between a petite black lantern from Pier 1, filled with tiny pears, red berries, and miniature pine cones, on one side, and a few Pottery Barn pears on the other side. This one came together a little bit more easily, and to date, it’s my favorite. Again, the 2 main colors are black and green, and the smaller, little bits of color are all in the same value range. This helps keep the overall look cohesive and focused. Well, that, and the pear theme! And now we are on to summer. 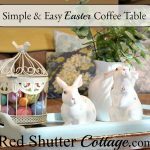 The basket that is the centerpiece was originally black until I spray painted it Antique white. Before I started on the summer shelf plate, I was doing one of these edit/delete/purge/donate dances and had placed the Antique white basket on its side for storage. Then I looked at it twice and had a brainstorm! 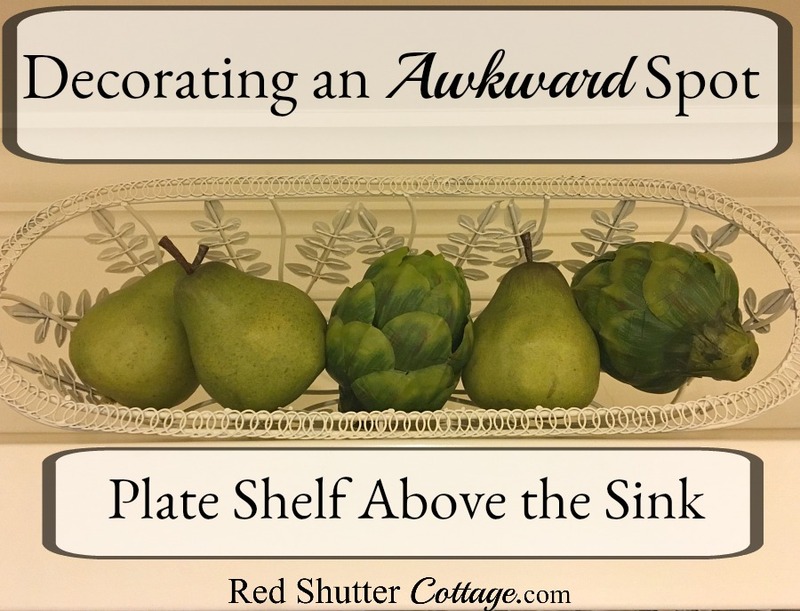 And this is the result; I just positioned some pears and artichokes in an arrangement, and there it was – a summer look for the plate shelf. I went through a few rounds of which white pitchers to use to flank the basket with pears and artichokes but finally settled on two tiny pitchers paired with two medium sized pitchers. The color palate is very straightforward here; just white and green. Simple, fresh and easy. 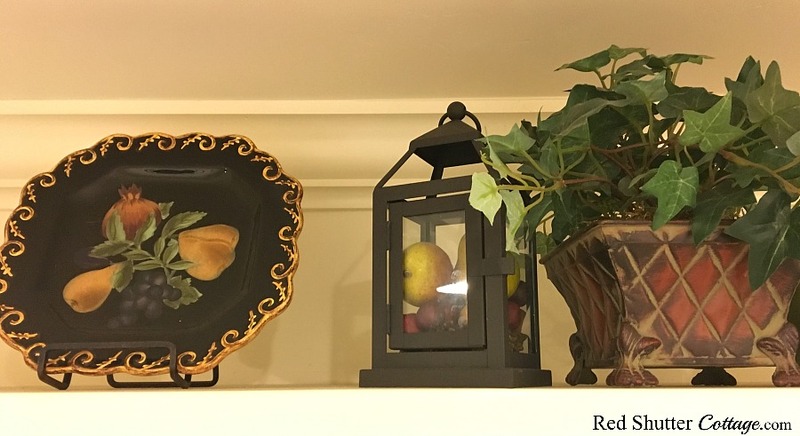 Quite a few of the items I used to style these plate shelves are included in my post How to Decorate Using 5 Classic Design Elements. 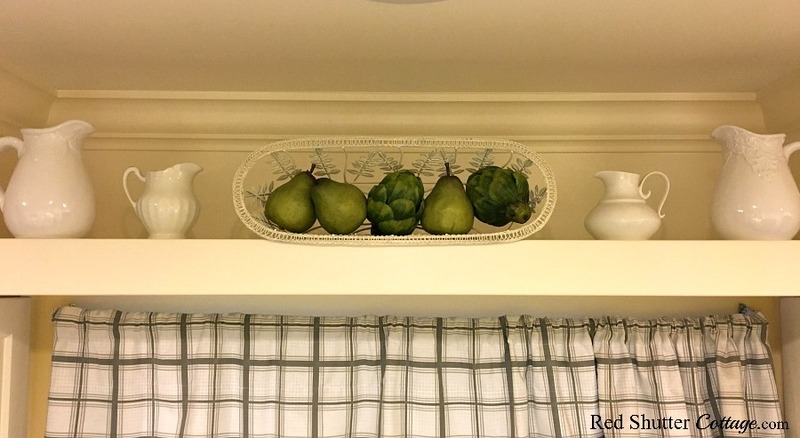 Here are some other resources to help with styling a plate shelf from Apartment Therapy and The Crowned Goat. 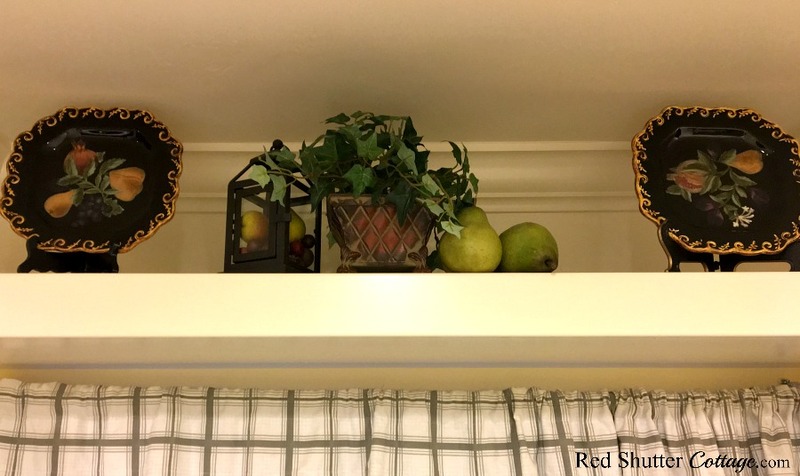 What I have learned from my first fumbling attempts to style my plate shelf? 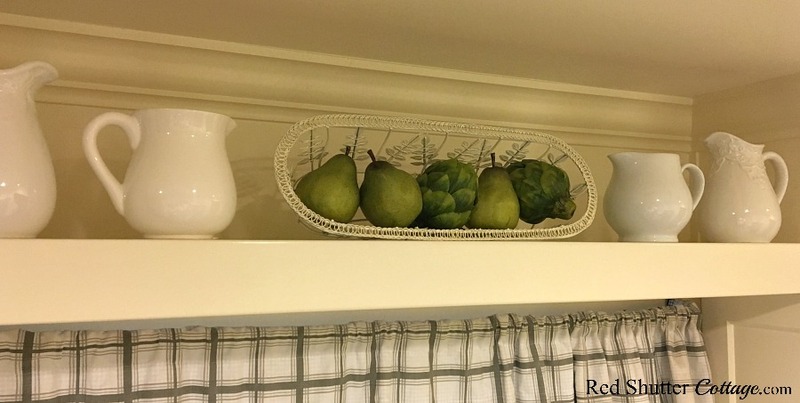 1) Keep everything as close to the edge possible, unless you have a high area above the plate shelf. Click the link to The Crowned Goat to see her ideas on this. 2) Don’t create a long line of items that run end to end on the plate shelf; create defined spaces, allow for white space. For the first two displays, I included two flanking items, and then a center vignette. For the summer look, I ran the pitchers and basket across the full length of the plate shelf, but left lots of open space between the items. Creating a look, a design, a vignette anywhere in your home is a process. It involves being careful with color. It takes time, patience and perseverance. 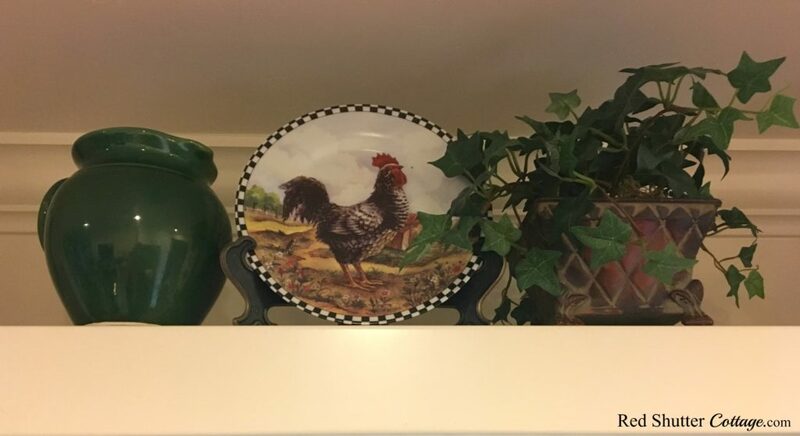 It takes keeping your eyes open to develop your own sense of style so that however you chose to decorate your plate shelf really looks like you. It also takes discipline; it’s tempting to put everything you love on a plate shelf, on a mantel, on top of a kitchen cabinet, but that does not always work. Take your time arranging, re-arranging, take something out, put something back in, keep moving things around until it finally looks right to you. Your comment about taking your time and being patient is so valuable. Decorating is fun, so take the time and enjoy the process, move things around until its just right. 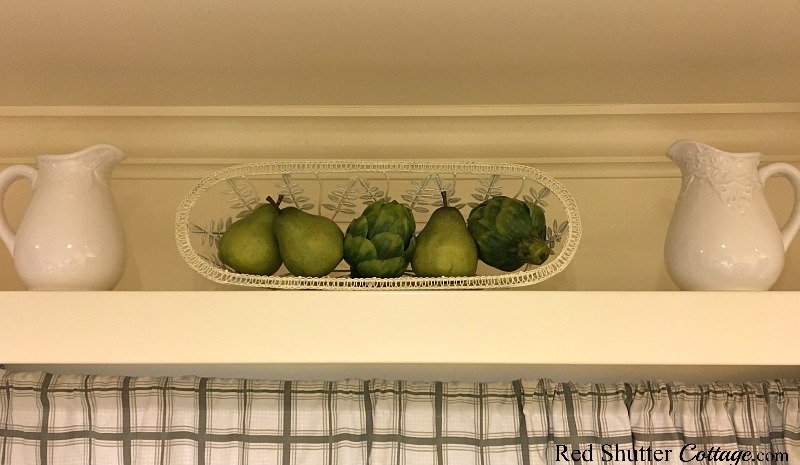 The space above the cupboard is the hardest spot to decorate and your plate shelf is a perfect example of how to do it correctly. It looks great. Leanna – Yep! And taking your time can sometimes take years to figure out how to use a space. I am pretty sure I have a few more “fails” in my future with this plate shelf – but it’s all part of the journey! Thank you for stopping by!